Nov. 25 (Bloomberg) -- Oil dropped below $76 a barrel in New York on speculation weaker growth in the U.S., the world’s largest energy consumer, may limit demand. Oil declined to a five-week low yesterday after the Commerce Department said the U.S. economy expanded at a 2.8 percent annual rate in the third quarter, down from a prior estimate of 3.5 percent. The Energy Department will probably report today that crude-oil supplies climbed by 1.5 million barrels last week, according to a Bloomberg News survey. Crude oil for January delivery traded at $75.84 a barrel, down 18 cents, in electronic trading on the New York Mercantile Exchange at 10:27 a.m. in Sydney. Yesterday, the contract fell $1.54, or 2 percent, to $76.02, the lowest settlement since Oct. 14. Prices have gained 70 percent this year. Oil market transactions may be lighter than normal through the end of the week because of the U.S. Thanksgiving holiday. There will be no floor trading on Nov. 26 and the market will close early on Nov. 27. The Energy Department’s report on supplies in the week ended Nov. 20 is due at 10:30 a.m. in Washington. The American Petroleum Institute reported yesterday that U.S. crude-oil stockpiles increased 3.35 million barrels to 336.4 million last week. Oil stockpiles worldwide are too high and nations must be careful about the amount of supply in the market, Nigerian Petroleum Minister Rilwanu Lukman said yesterday. The African country was OPEC’s eighth-biggest producer in October, according to a Bloomberg News survey. The Organization of Petroleum Exporting Countries meets on Dec. 22 in Luanda, Angola, to discuss production targets. The group agreed at its Sept. 9 meeting in Vienna to maintain production quotas at 24.845 million barrels a day. The Standard & Poor’s 500 Index declined 0.1 percent in New York yesterday and the Dow Jones Industrial Average slipped 0.2 percent to 10,433.71. The dollar traded at $1.4961 per euro at 10:16 a.m. in Sydney, from $1.4968 yesterday. Brent crude oil for January delivery on the London-based ICE Futures Europe exchange declined $1, or 1.3 percent, to end the session at $76.46 a barrel yesterday. Nov. 24 (Bloomberg) -- Gold rose for an eighth consecutive session in New York on speculation that the dollar may fall further and central banks and investors will buy more bullion as an alternative investment. Futures reached a record $1,174 an ounce yesterday as the U.S. Dollar Index fell the most in two weeks and Russia’s Bank Rossii said it bought more gold in October. The index is down 7.6 percent this year after the Federal Reserve cut its key lending rate to a record low in December and kept it there. Holdings in the SPDR Gold Trust, the biggest exchange-traded fund backed by bullion, rose to the highest level since June. Gold futures for December delivery gained $1.10, or 0.1 percent, to $1,165.80 an ounce on the New York Mercantile Exchange’s Comex division, after earlier rising as much as 0.6 percent. The most-active contract is up 32 percent this year, heading for the best annual performance since 1979. Gold for February delivery gained $1.20 to $1,167.40 an ounce. After the close of floor trading, the metal added to its gains as comments from the Federal Reserve weakened the dollar and fueled concern that inflation may accelerate. Fed officials said record-low interest rates might fuel “excessive” speculation in financial markets or an “unanchoring” of stable inflation expectations, according to minutes of their Nov. 3-4 meeting released today. In London, gold for immediate delivery gained $3, or 0.3 percent, to $1,169.10 an ounce at 8:31 p.m. local time. The dollar index, a six-currency gauge of the greenback’s value, was little changed. The measure touched a 15-month low on Nov. 16. The International Monetary Fund, which set out to sell one- eighth of its gold reserves earlier this year, is trying to complete the process as soon as possible, said Andrew Tweedie, the head of the IMF’s finance department. Earlier this month, India said it bought 200 metric tons from the IMF. Mauritius purchased 2 tons from the lender. Along with Russia’s central bank, Sri Lanka also has been buying gold. “The investment case for gold has become increasingly compelling,” Dan Smith, an analyst at Standard Chartered Plc, said in a report. The metal will average $1,150 an ounce next year, including $1,300 in the fourth quarter, he said. “There is definitely accumulation going on, whether by central banks or high-net-worth individuals, so we can see the gold price is going to carry on moving higher, but that doesn’t mean that we’re not going to see consolidation or pullbacks,” David Baker, a managing partner at Baker Steel Capital Managers, said in a Bloomberg Television interview. The rally has pushed London gold’s 14-day relative strength index above the level of 70, which is viewed by some investors and analysts who follow technical charts as a sign that the price may soon fall. Today’s reading was about 80. Holdings in the SPDR Gold Trust expanded yesterday to 1,121.46 tons, the most since June 29. The fund’s holdings reached a record 1,134.03 tons on June 1. Also in New York, silver futures for March delivery fell 15.5 cents, or 0.8 percent, to $18.494 an ounce. Platinum for January delivery dropped $23.80, or 1.6 percent, to $1,443.80 an ounce and March palladium slid 1 percent to $370.80 an ounce. Nov. 25 (Bloomberg) -- The yen and dollar weakened against higher-yielding currencies, reversing earlier gains, as renewed optimism over the prospects for a global economic recovery spurred investors to buy riskier assets. Japan’s currency fell against the Australian dollar after a report in Tokyo showed the nation’s exports dropped at the slowest pace in a year as government spending worldwide boosted demand. The Australian dollar rose against all 16 most-active currencies after central bank deputy governor Ric Battellino said the economy has entered a “new upswing,” fueling speculation policy makers will raise interest rates for a record third month next week. The yen declined to 81.64 per Australian dollar as of 10:01 a.m. in Tokyo from 81.34 yesterday in New York. Australia’s currency advanced to 92.31 U.S. cents from 91.92 cents. Japan’s currency was at 132.44 per euro from 132.47 yesterday in New York. The euro was at $1.4956 from $1.4968. New Zealand’s dollar fetched 72.55 U.S. cents from 72.58 cents in New York. Japanese shipments abroad dropped 23.2 percent in October from a year earlier, compared with a 30.6 percent decline in September, the Finance Ministry said today in Tokyo. The median estimate of economists surveyed by Bloomberg was for a 26.8 percent decline. 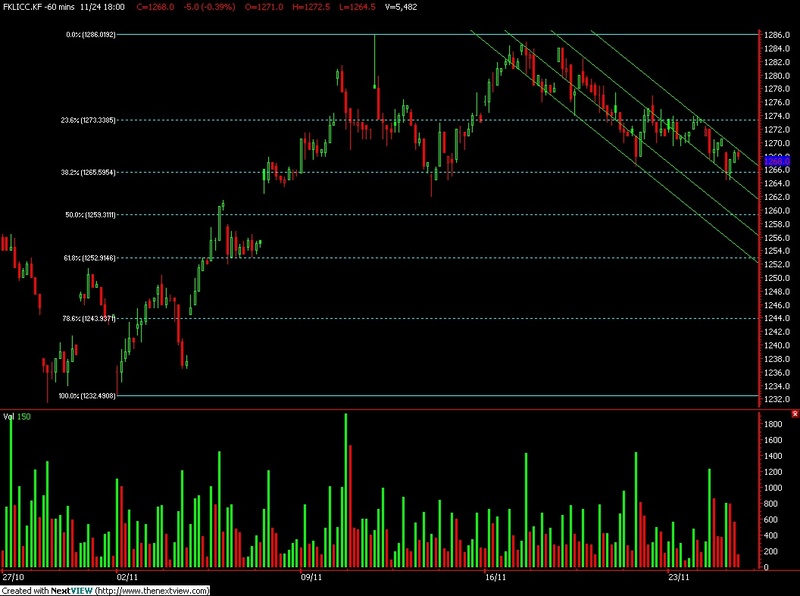 FKLI Nov Futures contract traded 5 points lower close at 1268 levels as compare to previous trading session to with a total of 5,482 lots traded in the market. FKLI was traded lower during trading sessions as regional indices and Dow Jones electronic trading were traded lower despite overnight Dow Jones Industrial Average were closed firmed on overnight trading. 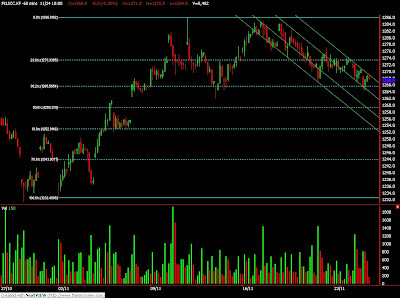 Technically, FKLI appear to move lower within 3 layer of downtrend channel while found its support at 1265 region; 38.1% Fibonacci support levels after swift sell down. Based on our technical view, FKLI still seen remain intact with bull trend provided support levels at 1252 and 1233 were not violated in the coming trading sessions. Our opinion suggests FKLI would trade higher provided FKLI price manage to hold above resistance level at 1270 and 1276 regions. 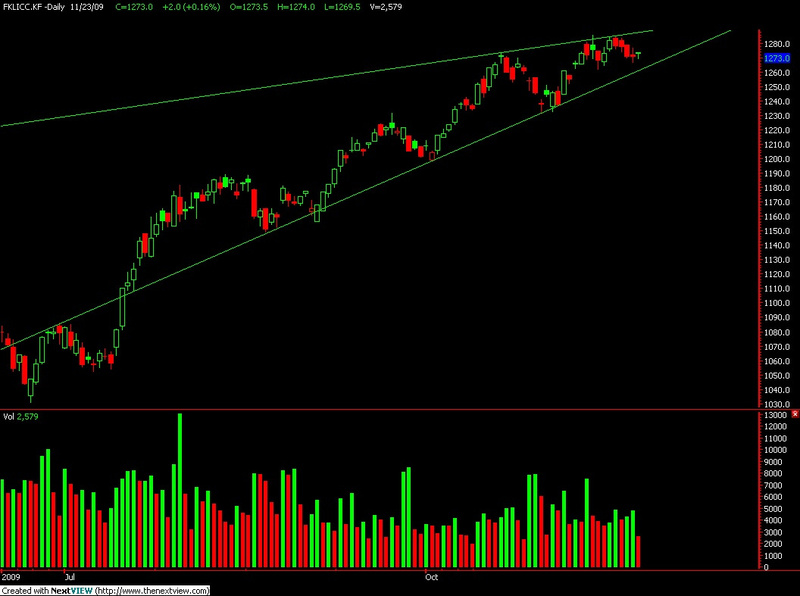 Traders were advice to hold long applying long on breakout strategy in the coming trading sessions. CPO 3rd month Feb futures contract traded RM8 points lower as compare to previous trading sessions to close at RM2478 with a total of 10,069 lots traded in the market. CPO price was traded lower during early session as soybean oil and crude oil were traded weak as they plunge lower after huge upwards swing due to heavy profit taking activities. 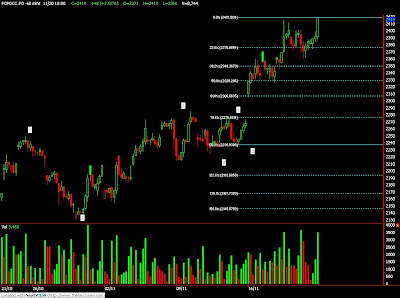 Technically, CPO price manage to close higher after manage to reach 61.8% Fibonacci support levels at RM2430 regions. Based on our technical view, CPO price seems to consolidate provided CPO price manage break resistance level RM2481 and RM2505 regions. Our opinion suggests CPO price would only confirm intact with bull rally provided CPO price manage to hold above RM2505 regions at all time. However, traders were advice to long position with long on average strategy in the coming trading sessions with support levels at RM2428 and RM2360 regions. CPO 3rd month Feb futures contract surge RM67 points higher as compare to previous trading sessions to close at RM2486 with a total of 9,624 lots traded in the market. CPO price was traded higher during trading session as soybean oil and crude oil were trade strong during electronic trading sessions. Technically, CPO price surge higher after manage to penetrate previous resistance levels at RM2415 regions and continue to test coming resistance levels at RM2500 regions. Based on our technical view, CPO price seems extending wave count where resistance levels seen at RM2505 and RM2543 while correction phase were expect to come soon. However, after long consideration, we opinion suggests CPO price remain intact strongly on bull trend without much speculation to retrace. 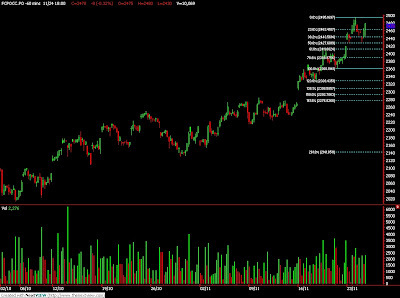 Traders were advice to apply long on average lower strategy in the coming trading sessions around support levels at RM2431 and RM2360 regions. 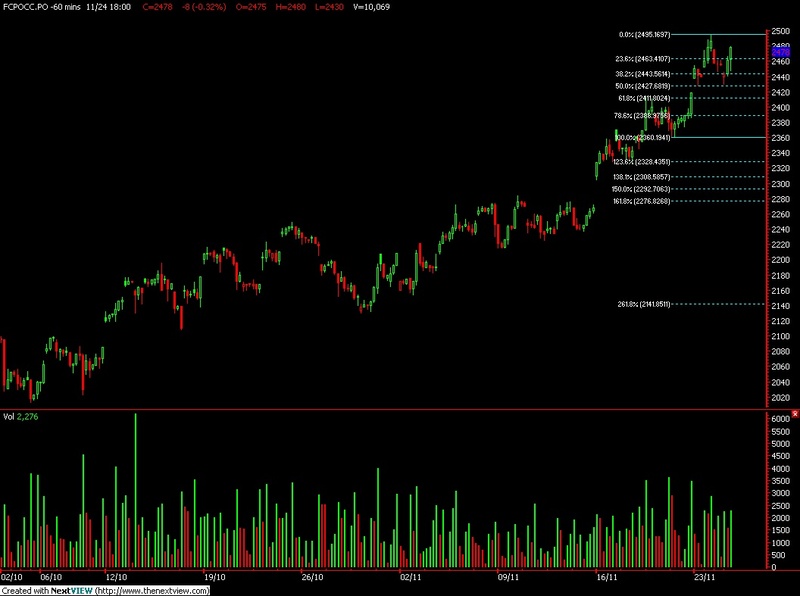 FKLI Nov Futures contract traded 2 points higher close at 1273 levels as compare to previous trading session to with a total of 2,579 lots traded in the market. FKLI was traded sideways during entire trading session despite regional indices and Dow Jones electronic trading were traded strong during trading sessions. Technically, FKLI appear to test support levels at 1269 and 1264 regions but fail to penetrate after few attempts in effort to search for lower support levels. 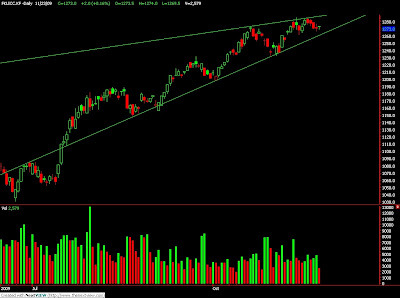 Based on our technical view, FKLI still seems strong while traded within the support and resistance trend line in the daily chart. Our opinion suggests that FKLI would consider traded sideways until price was traded beyond support level at 1250 and 1233.5 or resistance levels at 1277 and 1281 in either directions. 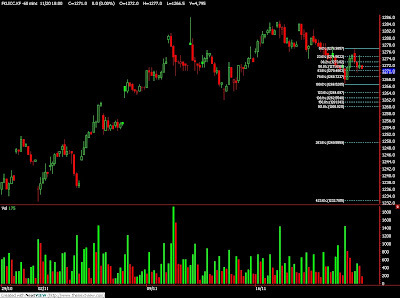 Traders were advice to hold long position as FKLI was yet to have bearish signal in the price chart. CPO 3rd month Feb futures contract surge RM48 points higher as compare to previous trading sessions to close at RM2419 with a total of 8,744 lots traded in the market. CPO price was traded lower during trading session as soybean oil and crude oil were traded firm during overnight trading. 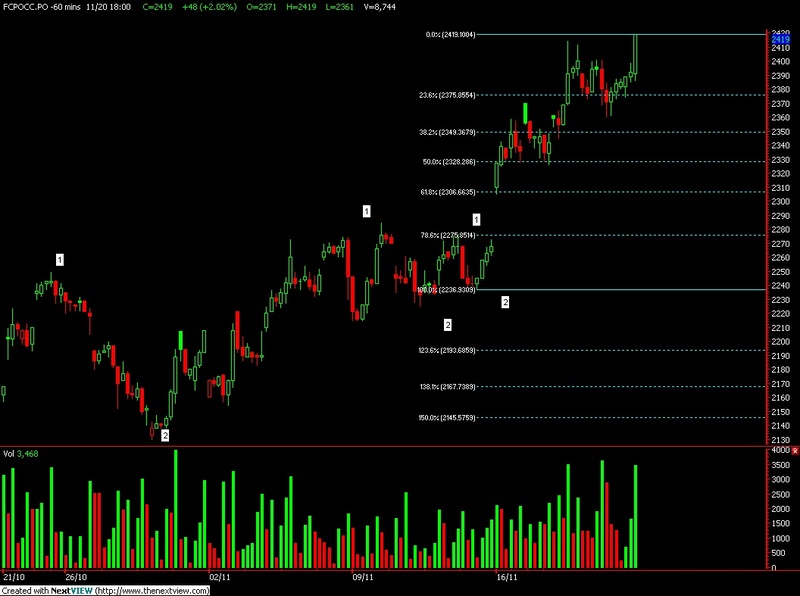 Technically, CPO price surge higher after stand firm above support levels at RM2360 regions; 78.6% Fibonacci support levels. 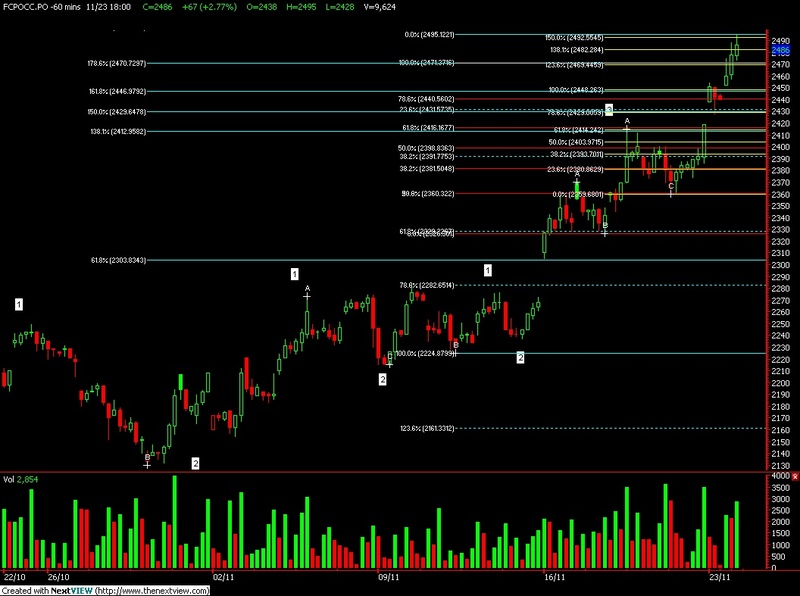 Based on our technical view, CPO price possible just complete minor count wave 5 where RM2415 and RM2421 range is 278.6% Fibonacci resistance levels. our opinion suggests CPO price possible to lower in the coming trading session provided resistance levels at RM2421 and RM2470 were not violated. Traders were still advice to apply long on dip strategy in the coming trading sessions where support levels at RM2327 and RM2306 regions. FKLI Nov Futures contract traded unchanged to close at 1271 levels as compare to previous trading session to with a total of 4,795 lots traded in the market. FKLI was traded mainly sideways during trading sessions despite regional indices and Dow Jones electronic trading was traded lower. Technically, FKLI test support levels at 61.8% Fibonacci support levels at RM1270 regions after previous low at 1267 regions in the hourly charts. 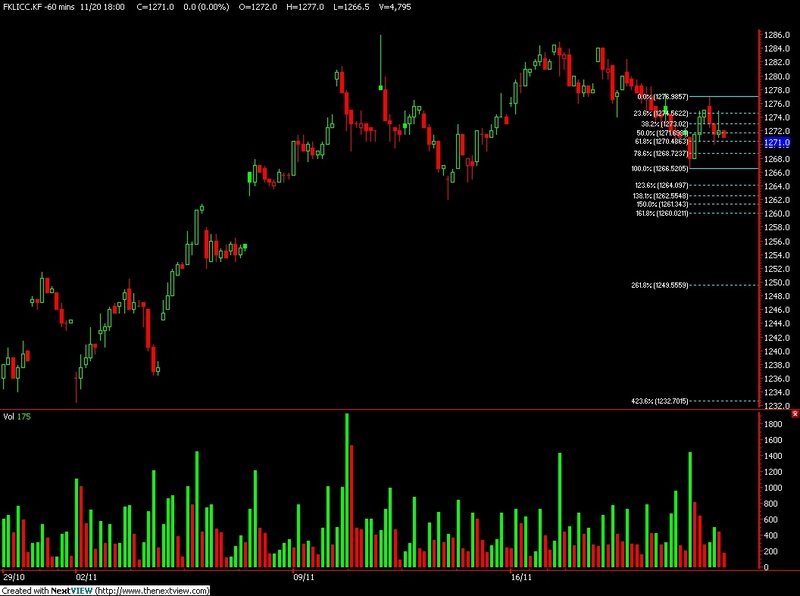 Based on our technical view, FKLI was seems bullish provided support levels at 1262 and 1267 regions were not violated during trading sessions. Our opinion suggests FKLI would trade higher in the coming trading sessions with condition support level must not be violated in order for bull trend to remain intact. Traders were advice to hold long position while be cautious around resistance levels at 1277 and 1284.5 regions. Nov. 20 (Bloomberg) -- Crude oil fell for a second day as the dollar strengthened against the euro, reducing the appeal of commodities to investors, and equity markets declined. Oil slipped 1 percent as the U.S. currency advanced for the third time in four days. Stocks and equity futures retreated after European Central Bank President Jean-Claude Trichet said policy makers will withdraw emergency cash gradually to avoid fueling inflation. Crude oil for December delivery fell 74 cents to settle at $76.72 a barrel on the New York Mercantile Exchange. Futures advanced 0.5 percent this week and are up 72 percent this year. The December contract expired today. The more actively traded January contract slipped 58 cents, or 0.7 percent, to end the session at $77.47 a barrel. Oil dropped 2.7 percent yesterday as the greenback gained and on concern the rally in commodities and equities has outpaced the prospects for economic growth. A weak dollar has bolstered commodities over the past two years as investors purchased raw materials as an alternative investment. The U.S. currency strengthened 0.5 percent against the euro to $1.4858, from $1.4925 yesterday. The Standard & Poor’s 500 Index slipped 0.3 percent to 1,091.38. Total U.S. daily fuel demand averaged 18.6 million barrels in the past four weeks, down 4.1 percent from a year earlier, according to an Energy Department report on Nov. 18. Brent crude oil for January settlement declined 44 cents, or 0.6 percent, to end the session at $77.20 a barrel on London’s ICE Futures Europe exchange. Valero Energy Corp., the largest U.S. refiner, said it will close its Delaware City, Delaware, plant because of mounting losses after the recession eroded demand for gasoline and diesel. Gasoline for December delivery climbed 1.11 cents, or 0.6 percent, to end the session at $1.9806 a gallon in New York. Commodities will likely attract a record $60 billion this year as investors seek to diversify their assets, Barclays Capital said in a report. Inflows so far this year are almost $55 billion, more than the previous full-year record of $51 billion set in 2006. Commodity assets under management may rise to $230 billion to $240 billion by the end of the year. Nouriel Roubini said that investors are “chasing commodities” and there is a risk of new asset bubbles emerging as stock markets and commodity prices surge amid record-low lending rates. Roubini is the New York University professor who predicted the global financial crisis. Part of the increase in oil prices is “money chasing commodities,” Roubini said in a speech in Lisbon today. “There is a risk that oil can rise to $80, $90 or $100 because of speculative demand” that doesn’t reflect economic fundamentals, he said. Analysts surveyed by Bloomberg News were split over whether crude oil prices will fall or be little changed next week. Ten of 27 analysts, or 37 percent, said futures will drop through Nov. 27. Ten respondents predicted that oil will be little changed. Seven said futures will rise. Oil volume in electronic trading on the Nymex was 383,077 contracts as of 3:18 p.m. in New York. Volume totaled 630,524 contracts yesterday, 12 percent higher than the average over the past three months. Open interest was 1.17 million contracts. The exchange has a one-business-day delay in reporting open interest and full volume data. Nov. 20 (Bloomberg) -- Gold prices climbed for the sixth straight session on speculation that the dollar will decline, boosting demand for the metal as an alternative investment. The dollar touched a 15-month low against a basket of major currencies on Nov. 16. The greenback climbed as much as 0.8 percent today. Gold reached a record $1,153.40 an ounce on Nov. 18 and has fallen once in 15 sessions this month. The metal has climbed 30 percent this year, heading for a ninth straight annual gain. Gold futures for December delivery rose $4.90, or 0.4 percent, to $1,146.80 on the Comex division of the New York Mercantile Exchange. Earlier, the price dropped as much as 0.8 percent. The metal gained 3.2 percent in the previous five sessions. In November, the price has climbed more than $100. The popularity of exchange-traded funds backed by gold may diminish the historic inverse correlation between the dollar and the metal during times of financial turmoil, Deutsche Bank AG said today in a report. Investors have poured $55.5 billion into gold ETFs in the nine months ended Sept. 30, Jason Toussaint, the World Gold Council’s managing director of ETFs, said this week. SPDR Gold Trust, the biggest bullion-backed ETF, has almost 1,118 metric tons, or more than China’s reserves. China ranks sixth among official holders with 1,054 tons, according to data from the producer-funded council. The U.S. is the largest. Silver futures for December delivery fell 1.5 cents to $18.44 an ounce in New York. Platinum for January delivery fell $2 to $1,441.90 an ounce. Palladium for December delivery declined $5.55, or 1.5 percent, to $364.35 an ounce, the biggest drop in three weeks. Nov. 21 (Bloomberg) -- The dollar rose against most of its major counterparts and posted its first weekly gain versus the euro in November as investors sold shares and bought short-term Treasuries to guard against losses before year-end. The yen gained versus the euro as stock indexes in the U.S., Germany and Japan dropped, discouraging demand for riskier assets. The greenback completed its fourth straight weekly loss versus the yen on bets the Federal Reserve, due to release minutes of its Nov. 4 meeting next week, will keep borrowing costs at virtually zero through the first half of 2010. The dollar strengthened 0.3 percent to $1.4862 per euro from $1.4903 on Nov. 13. The 16-nation currency touched $1.4802 yesterday, the lowest level since Nov. 4. The yen appreciated 1.2 percent to 132.09 per euro, from 133.63. The U.S. currency fell 0.9 percent to 88.88 yen, after touching 88.64 on Nov. 19, the lowest level since Oct. 9. The Fed reiterated at its meeting this month that it will keep the target lending rate at zero to 0.25 percent for “an extended period” and specified for the first time that policy will stay unchanged as long as inflation expectations are stable and unemployment fails to decline. The minutes are due Nov. 24. The Bank of Japan left its benchmark interest rate unchanged at 0.1 percent at the end of its policy meeting yesterday and raised its monthly assessment, saying the economy is picking up. “The yen won’t materially sell off until we see a rise in U.S. interest rates,” Adam Cole, London-based global head of currency strategy at Royal Bank of Canada, said in a Bloomberg Television interview. New Zealand’s dollar slid 3.5 percent to 64.36 yen and Sweden’s krona dropped 1.3 percent to 6.9306 per dollar as the drop in stocks discouraged carry trades, in which investors buy higher-yielding assets with amounts borrowed in nations with low interest rates. Benchmark rates in the U.S. and Japan, among the lowest in the industrialized world, make their currencies popular for funding such transactions. The Standard & Poor’s 500 Index fell 0.2 percent this week, and the MSCI World Index of shares dropped 1.1 percent. The Nikkei 225 Stock Average slid 2.8 percent, capping its fourth straight weekly loss. Treasury two-year note yields fell yesterday to the lowest level this year on concern the rally in riskier assets has outpaced U.S. growth prospects. Three-month bill rates turned negative on Nov. 19 for the first time since last year’s credit freeze as the 64 percent rally in the S&P 500 from a 12-year low in March pushed valuations to about 22 times its companies’ reported earnings, the highest level since 2002. Yuan forwards posted their biggest weekly drop in 10 months on speculation China will rebuff international calls for the currency to appreciate. The nation is “passive” on the value of the dollar, the central bank’s Governor Zhou Xiaochuan said at a forum in Beijing today, signaling policy makers aren’t yet prepared to loosen controls on the yuan. U.S. President Barack Obama urged China during his visit there this week to allow the yuan to appreciate. His Chinese counterpart, Hu Jintao, made no mention of the currency’s link to the greenback in a joint briefing. The yuan has traded at about 6.83 per dollar since July 2008 after a 21 percent gain in the previous three years. The link of the yuan to the weakening dollar has pushed the Chinese currency down 16 percent versus the euro and 8 percent against the yen over the past year, adding to pressure from China’s export competitors to let the yuan appreciate.